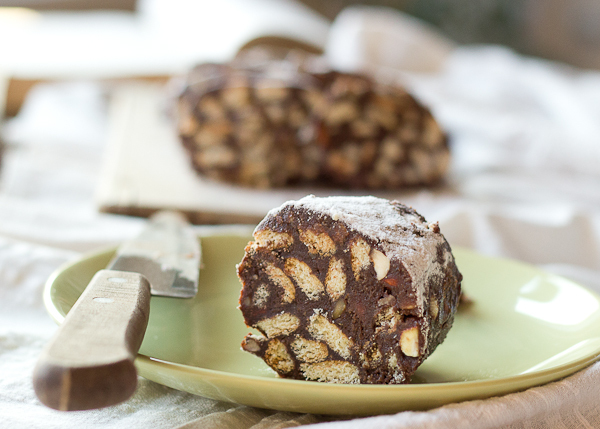 The Salami Cake may originate from Turkey, or Portugal, or wherever, but it is deeply integrated in our past and present, in our identity, so we consider it our own. That being said, I’ve never been a huge fan of this dessert. I used to find it too dry for my taste. At least until I started creating the dessert myself, that was. 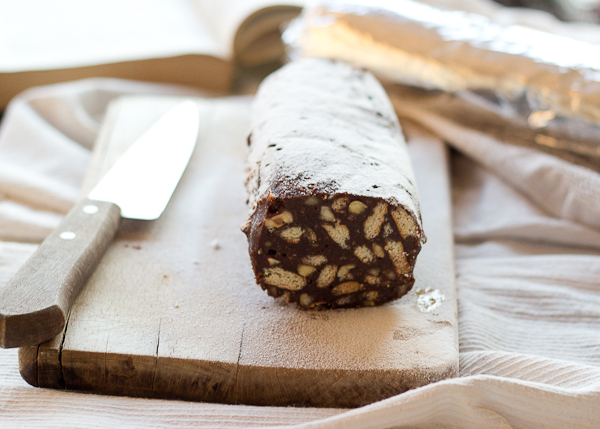 Then I made a Chocolate Salami the way I like it – moist, fragrant and with lots of nuts. And it was perfect. Perfect for feeding a crowd, perfect to bring to work, perfect to snack when the nerves kick in. It is very easy to build – no baking, no sophisticated elements, and no fuss. Just drop all the ingredients in a large bowl, mix well, chill well and devour the creation of the cultural collision. In a large bowl crush the biscuits coarsely, leaving them into chunks, rather than fine crumbs. Coarsely chop the walnuts and the almonds and add them to the biscuits. In a medium sized heavy bottom saucepan add the milk, butter, sugar, chocolate, cocoa powder and heavy cream. Bring the mixture to the scalding point, stirring constantly. The butter and chocolate should melt and the should be uniform. Gently break the egg in another bowl. Remove the chocolate mixture from the heat and slowly pour it into the egg whisking constantly. Return the concoction to the stove over low heat and whisk constantly for 2 minutes, don’t let it boil. Remove from the heat, stir in the rum and pour the mixture over the biscuits and nuts. Using a spatula or your hands mix thoroughly, until everything is incorporated and the biscuits are evenly coated with chocolate. Take a large piece of aluminum foil and lightly grease it using a little melted butter or a neutral oil to later ease the release of the cake. Empty the content of the bowl over the foil and pat it with your hands to even it out, forming a large roll. 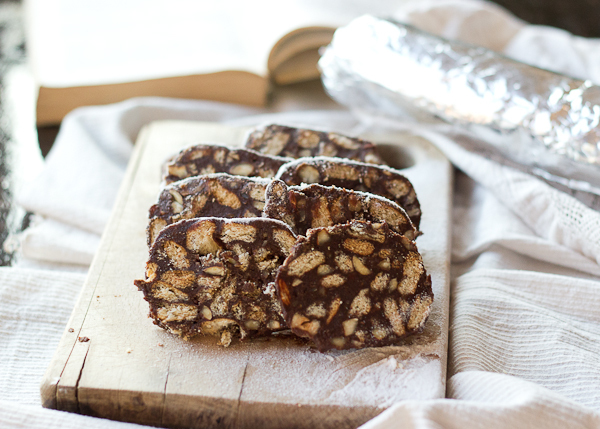 Tightly fold the foil over the Chocolate Salami and chill in the fridge for at least 24 hours. 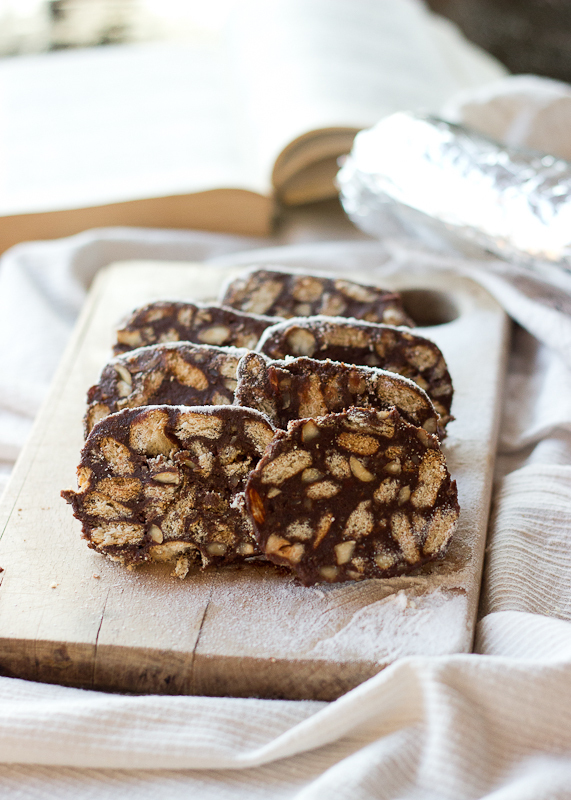 Remove from the fridge, gently unroll the foil, dust with powder sugar and cut the cake.